Today I wore every black/gold/sparkly thing I could find in my closet. Last night I was on Pinterest for the first time in a long time, and I saw so many pretty shiny things! This is probably why I decided to go for this disco ball inspired look. Recently, I have been trying to bring some of my old stuff out, and make it new. So, today I wore this dress that my sister gave me on my 19th birthday. I think the last time I wore this dress was about a year ago, and it needed a little bit of T.L.C. I layered it with one of my favorite tops that I wear very frequently. 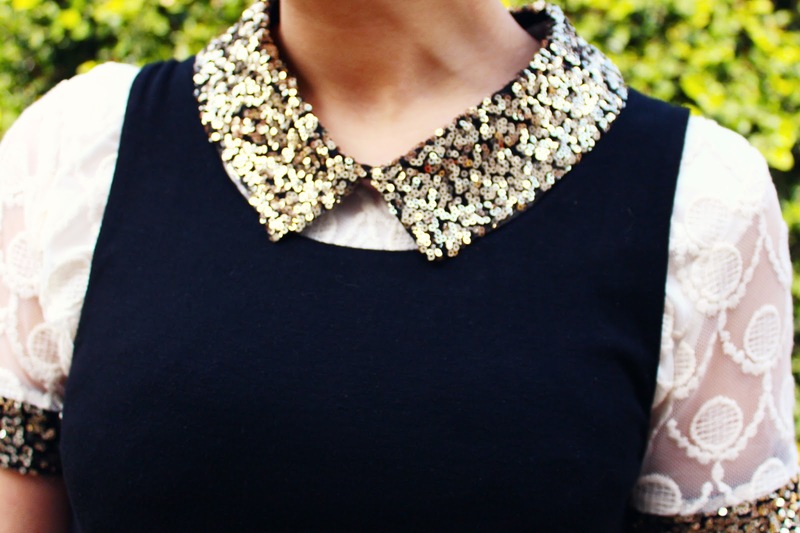 The collar pretty much makes this top! I have so many things in my closet that I haven’t worn in so long. It’s amazing how many different looks you can get out of one piece of clothing! So far this weekend has been so fun and relaxed! I started the day by getting a little bit of cleaning done around here. Then my hubby and I went out for lunch. We went for Italian food at Johnny Carino’s. My fave! After stuffing our faces, we went to go walk it off and do a little bit of shopping. We then picked up some frozen yogurt, and called it a day. Life is good. This outfit is probably my favorite yet! You're killing it with that top! This outfit is so perfect! And I love how affordable the brands are yet this looks so expensive! 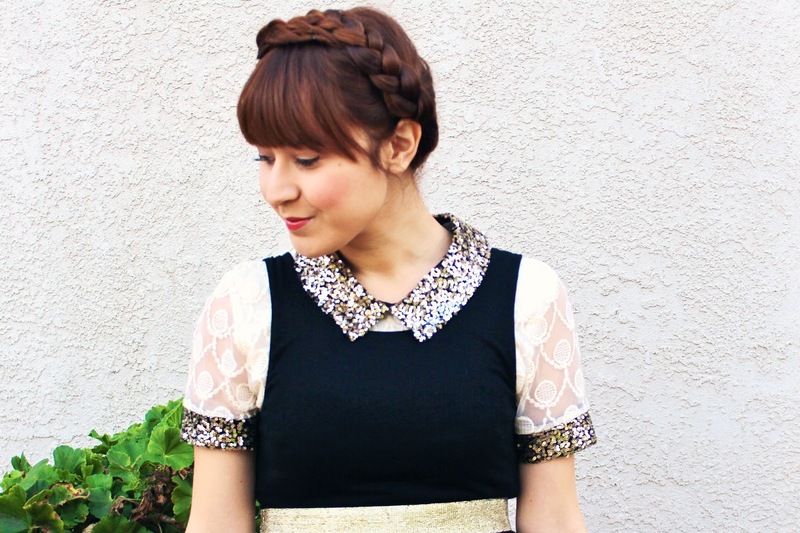 The heidi braids go great with this look. I am in love with your top! Makes me crave some glitter in my wardrobe. 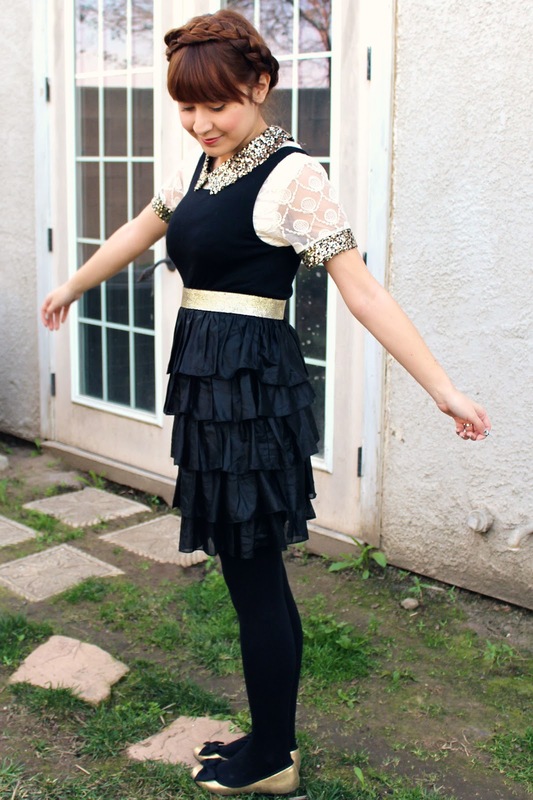 Also, love the black gold and lace combination, you look gorgeous. Pinterest is awesome! Thank you, Beth! Aw! Thank you! I would love to see how you recreate it!